The 5 Best P-90 Pickups – A Versatile Vintage Classic! Sitting somewhere between a humbucker and a single-coil pickup – at least in terms of sound and feel – the P-90 is considered by many players as the finest all-round guitar pickup of all-time. It’s quite a claim, but after reading this article you’ll be as convinced as us! Introduced in 1946 by Gibson, the P-90 was revealed as a single-coil pickup offering the bite and brightness you’d expect from the traditional single-coil, but with the added power and richness you’d get from a humbucker. This is why P-90s were such a hit, due to their high output which could deliver the bold, rock guitar sound that guitarists were craving, with not too much twang. The P-90 was the standard pickup in Gibson guitars from 1946 up until the late 1950s, when the humbucking PAF arrived on the scene. Even though they dropped in popularity in the decades that followed, players are once again enthused over the P-90, choosing to make use of its vintage-tinted, well-rounded tone – whether buying a new guitar with P-90s already installed, or fixing a new set to an existing axe. Which is why we’ve put together a chart highlighting seven of our favourite P-90s worth considering if you’re looking to buy, as well as a short guide to the basics of this awesome pickup. Let’s check them out! Vintage-correct P-90s – the closest you’ll get to authentic ES-330 pickups! A quality set of American-made P-90s from the Virginia-based brand. One of the most popular P-90s on the market, with true vintage growl. P-90, humbucker and single-coil – three pickups rolled into one! An affordable P-90 that shows excellent value for the sound quality. Unless you’re willing to pry the P-90s out of an authentic 1959 Gibson ES-330, picking up a pair of Seymour Duncan’s Antiquity P-90s is the next best thing. Under the impressively aged black plastic dog-ear cover, sits the same hand-fabricated bobbin, Alnico II bar magnets, plain enamel mag wire, and flatback tape you’d have found on the original. So it’s no surprise that this modern-day P-90 (available in both bridge and neck models) sounds pretty close to the original too! It delivers a smooth vintage tone, with nice grit and balance. Chords are bright and crisp, while single notes remain clear but well-rounded. Although the Antiquity is one of the most expensive P-90s on our list, it’s one that fully justifies its price tag. Lindy Fralin may not have the same fame as a brand like Seymour Duncan, but the Virginia-based manufacturer sure knows how to make a solid pickup – as their P-90 proves. They describe these soap bars as a ‘P-90 on steroids’ and we’d be inclined to agree. Made with Alnico IV magnets and plain enamel wire, the output is huge with a delightful tone. It’s well-balanced with an emphasized mid-range when played cleanly, although it really shines with a gritty snarl as the overdrive is increased. However, despite the growl, these P-90s show nothing but clarity. They’re available individually as either neck or bridge pickups, but also come together as a set. Not the cheapest P-90s, but worth the investment. For a true P-90 growl, it’s easy to see why players head straight for Seymour Duncan’s PhatCat. Handmade in California, this true single-coil P-90 soap bar pickup is made with Alnico II magnets with a nickel-silver baseplate, fitting in standard humbucker slots in either the neck or bridge position. The PhatCat is great for rhythm and lead, and offers bright, ringing chords with a mix-cutting brightness and superb sustain for soloing. It offers beautiful clean tones, and plenty of classic P-90 grit when a little gain is added. An added bonus is that it’s a little quieter than other soap bar style pickups, with wax-potting helping keep things squeal-free. For the price, this cool pickup offers pretty good value. 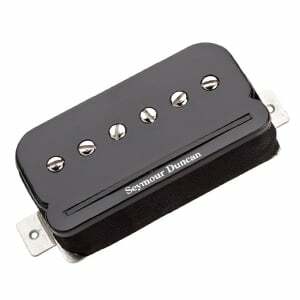 P-90 purists may not agree with this entry, as the SHPR-1 from Seymour Duncan certainly isn’t your traditional P-90. However, this innovative hybrid pickup is very much worth your time if versatility is what you crave. Available for both bridge and neck, the SHPR-1 is actually a humbucker that splits into both a P-90 and a Strat single-coil. After installing a three-way mini-switch (on-off-on), this pickup offers a fat, true P-90 tone with vintage character aplenty – the P-90 is definitely the highlight. The humbucker is rich and well-balanced, while the single-coil offers great twang and crispness (even if it’s a tad thin). Perfect for everything from country and surf, to classic rock and metal. With such versatility, at just shy of $100, it shows pretty great value. Even as one of the cheaper pickups on this list, Tonerider’s Hot P-90 is one of the best when it comes to sound quality. It features a lovely balanced tone with great bass response, articulate mid-range, and a bright high-end that cuts through the mix beautifully – as a true P-90 should. Wax-potted to minimize feedback, this Tonerider features an Alnico V bar magnet that’s overwound for a hot output and powerful tone, that retains its clarity as the gain and volume increases. These P-90s are available with either cream or black covers. For the sound on offer, these show excellent value – perfect for rock or blues players wanting to explore the world of P-90s for the first time. While we’ve suggested that a P-90 is half humbucker/half single-coil, it’s not. 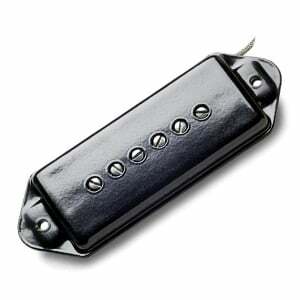 It’s a single-coil, although certainly does offer some characteristics of a humbucker. Without getting too technical, P-90s have a similar construction to Strat single-coils, although they feature flat alnico bar magnets under the coil bobbin. The coil itself is larger and flatter than a Strat pickup too, while the adjustable pole-pieces aren’t magnetic themselves – differing from the magnetic pole-pieces you’d find in a Strat pickup. P-90s actually come with a couple of different casing styles – such as soap bars (which naturally resemble a rectangular bar of soap), dog ears (where the side extensions resemble the ears of a dog! 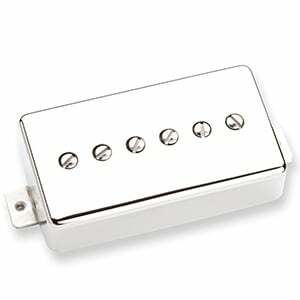 ), and the classic humbucker size. While there’s nothing fundamentally different with the electronics, these shapes are usually meant for specific guitars, so ensure you’re selecting the right style for your guitar. As we’ve established, the tone of a P-90 sits somewhere between a single-coil and a humbucker, although with unique tonal characteristics that make it a real audiophile’s pickup. They feature a relatively low output, but with a beefier sound than a single-coil and more articulation than a humbucker. P-90s are actually a very versatile pickup, capable of impressing in all genres – especially rock, blues and jazz. 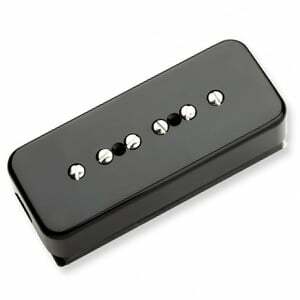 Perhaps they aren’t the best pickups for metal, due to being less robust than dedicated humbuckers, but can certainly handle heavy overdrive and distortion very well. Many famous players have dabbled with P-90s in their history, but notable regular users include Pete Townshend, Mick Jones, Tony Iommi, Carlos Santana, Rivers Cuomo, Billie Joe Armstrong, and Les Paul himself. While they can offer a great mix of both single-coil and humbucker tones, a P-90’s biggest disadvantage comes in the form of hum – after all, they are still single-coils at their core. However, the more modern P-90s are actually very quiet when it comes to excess noise, so it’s becoming less of a problem. After browsing our chart and guide, you will hopefully have learned that P-90s are pretty amazing pickups, and versatile enough to fit most music styles. If you’ve never considered trying them, now is the time – especially if you crave that true vintage growl. Whatever you do, make a considered choice before parting with your hard-earned cash. Check out the P-90s on our chart for some inspiration, then go and read some reviews and watch some videos of them in action. You didn’t test the Lollars? Shame on you!!! Hey! We did not ask you about gender, because we don’t think it matters in the awesome world of guitar. What matters is the passion about guitars that everyone holds. You are not obliged to make the survey, you can just click on the X button on the top right corner and completely dismiss it. As for the name of our site, I am sorry to say it, but the founder is in fact a fella. I want to apologize if this fact makes you feel offended in any way. Looking forward to a GuitarGal version, we will be more than happy to recommend it to our visitors.